Name comes in all uppercase letters. Spelling & punctuation will appear exactly as you entered it on your order. Please note, the more characters you request, the smaller the text will be. This line is case sensitive and it is required. Spelling & punctuation will appear exactly as you entered it on your order. Please note, the more characters you request, the smaller the text will be. Text for Line 2 is case sensitive and it is required. Spelling & punctuation will appear exactly as you entered it on your order. Please note, the more characters you request, the smaller the text will be. Have something to say? 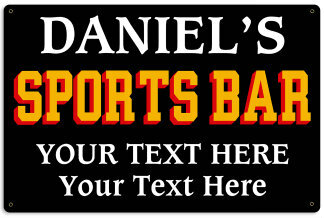 Create your own Personalized Sports Bar Metal Sign. Ideal for any occassion, this Personalized Sports Bar Sign comes personalized with your name and allows you to create two lines of your own text. There is a 28 character limit per line of text and a 18 character limit for the name. The personalized name comes in all uppercase letters. The lines of text are case sensitive. Please note that the word, SPORTS BAR on this sign can not be changed. Durable and attractive, this Personalized Sports Bar Metal Sign is 18 in. x 12 in. and has a long lasting finish. It is drilled and riveted for easy hanging. Proudly hand made in the USA, is just under 2lbs and made of heavy 20-gauge American steel. Therefore, this is NOT a flimsy sign. A Man Cave Gifts Exclusive!